Military service is difficult, demanding and dangerous. But returning to civilian life also poses challenges for the men and women who have served in the armed forces, according to a recent Pew Research Center survey of 1,853 veterans. 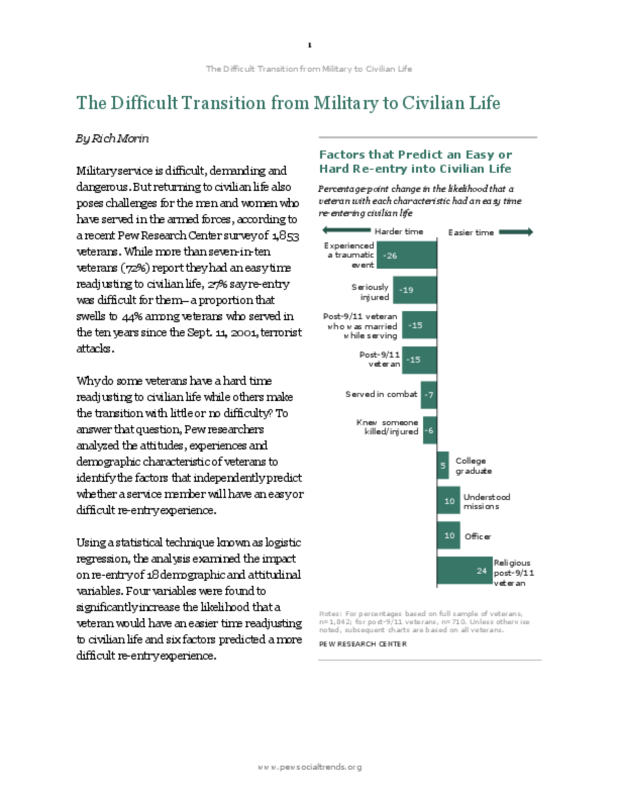 While more than seven-in-ten veterans (72%) report they had an easy time readjusting to civilian life, 27% say re-entry was difficult for them -- a proportion that swells to 44% among veterans who served in the ten years since the Sept. 11, 2001, terrorist attacks. Using a statistical technique known as logistic regression, the analysis examined the impact on re-entry of 18 demographic and attitudinal variables.